An archers bow might be his bread and butter, but that does not make their quiver any less important or necessary. After all, if an archer did not have their Simple Archers Quiver slung over their shoulder, where would they hold their arrows? When it comes to carrying your arrows, nothing could be simpler when it comes to this quiver. It is attractively crafted from 7-8 oz. leather and is available in a variety of different colors. The simple style is further accented by the lacing, which holds the quiver together and runs along the bottom rim as well as along the back of the quiver. 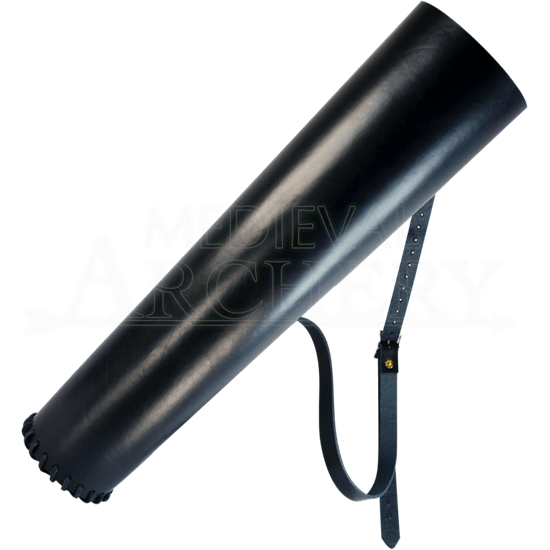 The quiver comes complete with an attached, adjustable shoulder strap, which means that it will fit archers of any size. It possesses a diameter of approximately 4.75 inches and an overall length of 19.75 inches. This style of quiver is simple, unobtrusive, and highly effective, making it a great choice for archers of all sorts, whether you are using it to store away your LARP arrows or your traditional arrows. This quiver is hand crafted right here in the USA and is exclusive to our shop. If you are looking for a general purpose quiver that fits into darn near any style you could imagine, while still effectively securing all of your arrows, then you need look no further than this Simple Archers Quiver, which will serve you well in all of your archery endeavors.